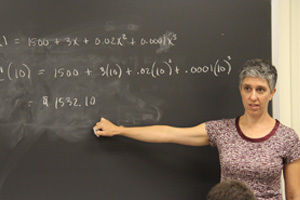 This major is for students interested in teaching mathematics at the middle and high school level. Mathematics teachers play a critical role in our society, and students who complete this program are in great demand. Secure desired employment or gain admission to graduate or professional programs of study. Gain experience working with students through tutorships and internships. To be accepted into the BA.MAT.SED program, students must obtain a positive letter of recommendation from a faculty member; receive approval from the Mathematics Department chair; and select an academic advisor in the Mathematics Department. And complete all Education Department requirements for Secondary Education.